Better employment prospects, rising home values and historically low mortgage rates are driving improvements in housing markets across the country. If these facts are tempting you to take the plunge, you’re not alone. Keep in mind, buying a home is a major commitment and shouldn’t be undertaken without careful consideration, say experts. “While homeownership is often referred to as the ‘American Dream’ for good reason, it isn’t necessarily everyone’s right move,” says Freddie Mac Senior Vice President and Head of Single-Family Sales and Relationship Management, Christina Boyle. From paint colors to major remodeling projects, one of the best parts of ownership is having a place that is uniquely yours to customize. Consider the financial benefits, as well. At tax time, you may be able to deduct the interest on your mortgage and property taxes, offsetting a portion of the cost of ownership. Stability is another major draw. With fixed-rate mortgages, your monthly principal and interest payments will stay the same for the entire period of the loan. This will make it easier to plan and budget over time, as opposed to renting, where rates are largely beyond your control. Furthermore, creating equity for the future will help provide stability and security for your family. Being your own landlord makes you responsible for the maintenance and upkeep of your property. Budget for maintenance costs — from little fixes to such major, costly issues as roof replacement and water pipe repair. Other home-related costs to keep in mind include utilities, homeowner association dues, homeowner insurance premiums and property taxes. Just like with your rent, your mortgage and utilities should be paid on time. This will help you maintain good credit and is essential if you want to borrow again in the future for home renovations, new cars or student loans. An honest self-assessment can help you determine if buying a home is right for you. Do you have a reliable income, good credit and documentation to verify your savings? Do you have the money required for home maintenance and a cash reserve that can withstand a loss of job, illness or other financial setback? Freddie Mac recommends that potential buyers be able to afford at least three-percent of the down payment and related closing costs. Also, evaluate your life plans. Are you planning on staying in your home for at least five years? Free online tools can help you get down to brass tacks. For a rent vs. buy calculator, a tax savings calculator, as well as tips, videos and tutorials needed to make well informed decisions, check out “My Home,” at MyHome.FreddieMac.com, a one-stop reference designed to help people become smarter homebuyers, homeowners or renters. Before taking any major plunge, get informed. An honest appraisal of the facts and figures can ensure a sounder financial future. If you’re buying a home, there are additional expenses you may want to budget for beyond the down payment and monthly mortgage. Home projects, even small ones, can really add up. 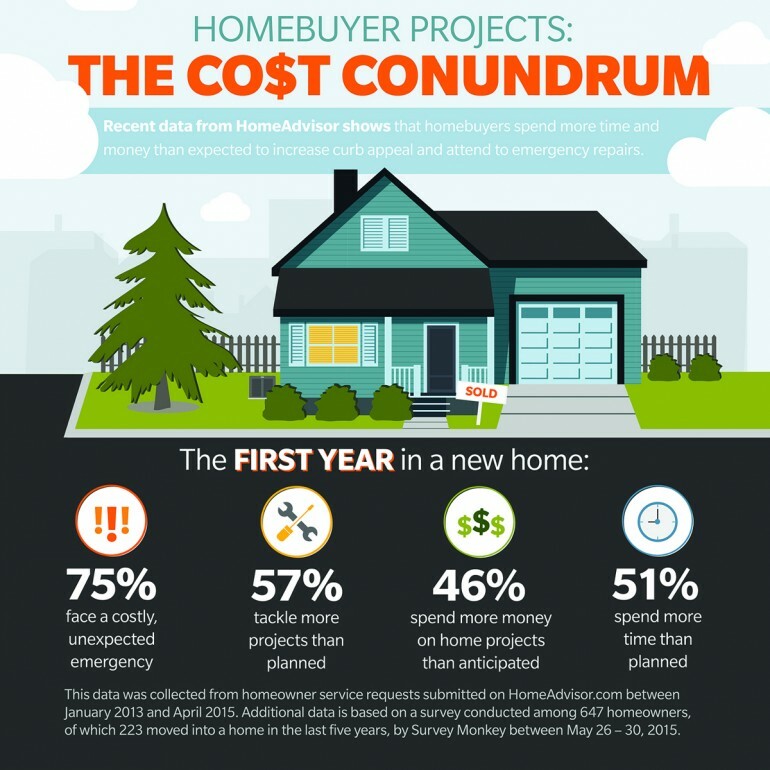 The most frequent emergency projects reported by homebuyers in the first year of owning a new home included blocked toilets and pipes, a clogged drain, a broken heating or cooling system and water leaks. These unexpected projects can cost homeowners anywhere from $199 to fix a clogged drain to $2,068 to repair water damage according to HomeAdvisor’s True Cost Guide. “To help prepare for these unexpected costs, homebuyers should plan to spend one-percent of their home purchase price on repairs and emergencies each year,” says Marianne Cusato, special housing advisor to HomeAdvisor. Getting Set to Sell: Which Home Upgrades Matter Most? Whether you’re preparing to sell, or just looking to increase your home’s value, it’s important to think about strategic upgrades — and not just how; but where to remodel. Here are a few ideas to help you prioritize home remodeling endeavors. Imagine walking up your driveway as a potential buyer. Does the exterior leave a lasting impression? Begin the process of preparing your home for sale at the front door by creating an inviting entryway that will entice potential buyers even before they step foot inside. Adding a pop of color to your front door will make a statement, and changing out the hardware fixtures will update the look instantly. Cleaning up your lawn, power washing siding, and planting trees, bushes and flowers are simple ways to invest in your home’s curb appeal. Lining the walkway with solar-powered lights is also a nice touch. Bathrooms and kitchens are the most popular renovation projects, with the greatest number of consumers concentrating their attention on the bath, according to a recent Houzz and Home survey of homeowners. When remodeling, focus on details that can quickly update the space, such as installing quality fixtures. As you begin the selection process for new bath fixtures, consider those with a timeless style that will be appreciated by you and a wide variety of home buyers. For versatility, check out the Wynford collection from Moen, which offers a wide range of faucet options and finish choices. Increasing storage, along with a few other fixes, can add thousands of dollars to your home’s value, according to a Bankrate.com report. Key updates improve both the look and functionality of the bathroom. Try adding storage or installing a new shower curtain rod. A curved shower rod, such as those from Moen, can add up to an additional seven inches of space in the shower. More than two out of five real estate professionals rank dirt, smells and clutter high on their list of costliest home-selling mistakes, according to a recent survey by Consumer Reports. Smells could indicate a serious problem in the home, such as mold or mildew. Use a dehumidifier to dry out damp areas. Also, have your carpets and drapery professionally cleaned on a regular basis, especially if you have pets. If your home could use a deep clean, it might be worth investing in a professional service. Concentrating on essential repairs and easy updates can instantly change the perception of your home and help you make the most from your sale.